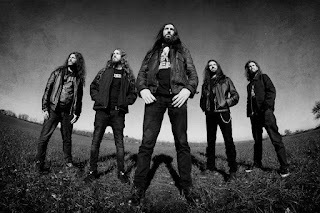 Vinterblot are a band formed in Apulia, Italy; They started playing around 2008, their music is a blend of Death, Black and Pagan metal, so far; They have released two prior recordings before, "Realms of the Untold" the first one is their independent EP debut entitled "For Asgard" back in 2010 which contains six tracks mostly influenced by the kings of the sub-genre Amon Amarth, you can hear clearly how this EP was conceived, later on they released their first full length "Nether Collapse", early in 2012 under Rising Records, this album is not far away from their sound captured in their EP, but they began to experiment and spread the range, adding a diverse vibe, the riffage still heavy as death metal should be, but they succeed to give an epic approach. This band has one of the many qualities I appreciate in a metal band, a steady line-up, because I truly believe there is a slightly chance to find the right partners from the beginning and grow with them pursuing the same ambitions, there is nothing wrong with a band who decide to switch members, everything is valid here, either to innovate, to improve, personal reasons or whatever reason you want to add in the list, there is not a predetermined formula, as I stated before Vinterblot started, around 2008 with Fjorgynn and Vandrer on guitars, Eruner in bass, Wolf behind the drums and Kvasir in vocals who was rapidly replaced by Phanaeus, in 2013 Vandrer departs from the band and Auros joined them, with this line-up is how they compose and recorded "Realms of the Untold". 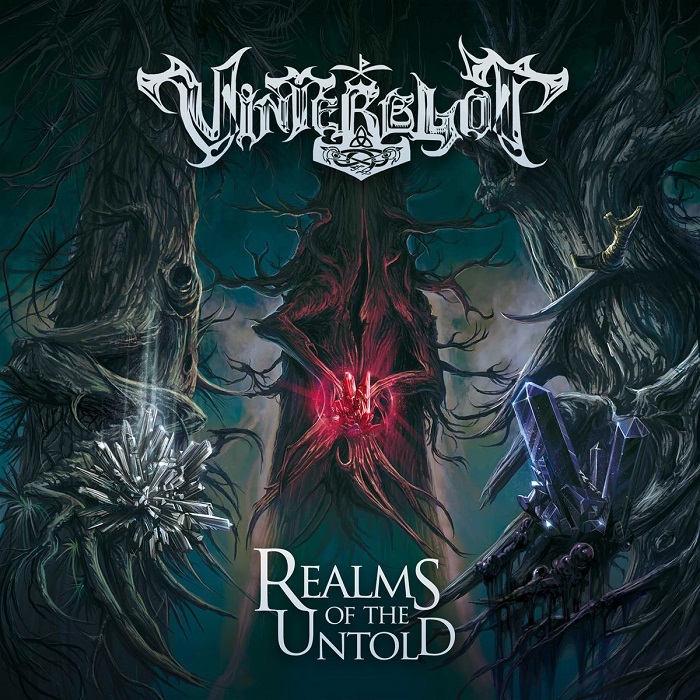 Vinterblot released their second full length "Realms of the Untold" in January 25th, 2016 containing nine tracks and somehow they still dwelling in the same sound, that they developed in their debut album, demolishing heavy and catchy riff, but the Amon Amarth vibe still present there, "Evoked by Light" structured with vicious riff sweep the road to Valhalla, this is a mid-pace track, I still wonder why do they choose this track to open their album? "Frostbitten" it's sound is more aggressive with pounding drums somehow they are able to inflict the speed and intensity but never reach the pinnacle, "The Summoning" picks up a little bit with a catchy melody in the background but again pretty much flat, "Vagrant Spirits in a Misty Rainfall" remains with a dense riffage and some familiar melody, the drums are compelling, "...Of Woods and Omen" brings up an eerie acoustic guitar, it is a nice work that eventually get distorting, to make it even more memorable, "Throne of Snakes" exceptional track from beginning, crushing riff with guttural vocals explode with authority, certainly giving their own tight and epic label, the last track "Triumph Recalls My Name" came out about a year ago as their single, this track is very adventurous and epic, deeper growling vocals are clear enough to sing along, despite the slightly reminiscent of the aforementioned kings of the sub-genre, they were able to manage and leave a mark of something promising in the near future. Vinterblot has the desire to cause an impress, but unfortunately didn't work for me very well, regardless the mixed and mastered by the legendary Swedish Producer and Artist Dan Swanö (Opeth, Dissection, Edge of Sanity and many more! ), I believe they fail to balance the album, the first two thirds are pretty much flat, senseless, until the last third, right there is when I felt hooked by them, but you guys make your own choice and I really hope you disagree with me.